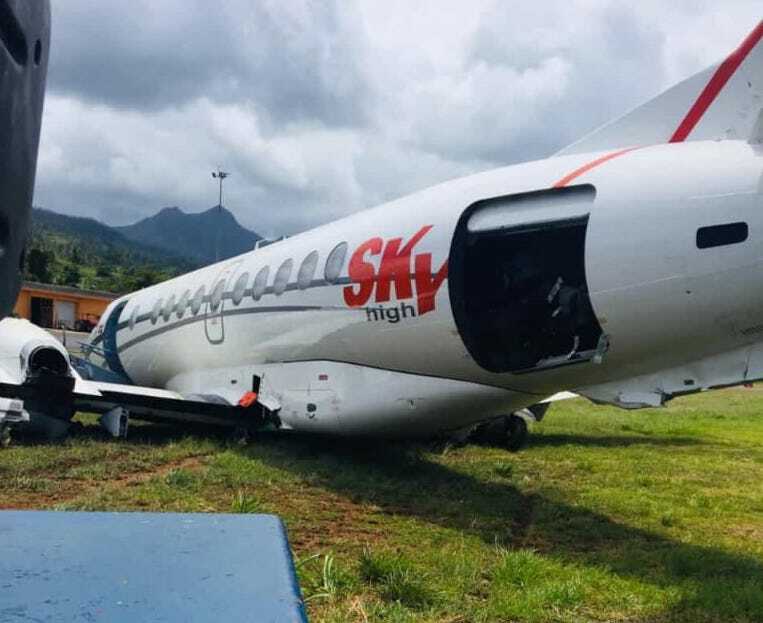 A BAe Jetstream 41, operated by Sky High Aviation Services, suffered a runway excursion after landing on the runway at Dominica’s Douglas-Charles Airport. The airline which is registered to the Dominican Republic based company Sky High Aviation Services operates flights from Santo Domingo, Tortola, Aruba, Curacao, St Maarten, Bonaire, St Kitts, Antigua, Cuba, Bahamas, Eustatius, Jamaica and Dominica. The aircraft which departed from Santo Domingo-Las Américas José Francisco Peña Gómez Int’l Airport, Dominican Republic, suffered substantial damage as a result of the crash. An amateur video recording from the scene shows an undercarriage leg and debris on the runway with the small fleet of propeller-driven aircraft resting in the grass next to the runway.